My search for Chuck Comer was well worth the effort. It's nice to have the facts about a certain artist whose career has not been well documented. I was born in the state of Arkansas on July 27th, 1934. My mother raised me because my father died when I was 2 months old. We spent time in St. Louis, Missouri and other parts of that state for a while. We also lived in Oklahoma, New Mexico and Virginia. In 1952 we finally settled in Newport, Arkansas. That's where I began my career in radio. I started playing the guitar when I was 17 years old. In 1953 the local radio station KNBY in Newport had an amateur talent contest and I won 2nd prize. Out of this came a 15 minute program 3 times a week - just my guitar and I singing songs. Intermittently through the next few years I had programs on the local radio stations although I did wonder to the Florida Harvest festival and Chicago and various other places. Up until about 1956 I had spent a few months at Keegans School of Broadcasting in Memphis, TN. I also played local shows with different pickers that I knew. We would play small clubs in the vicinity. 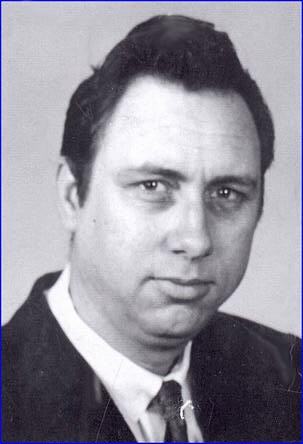 Around 1959 or 1960 I made my first recordings. 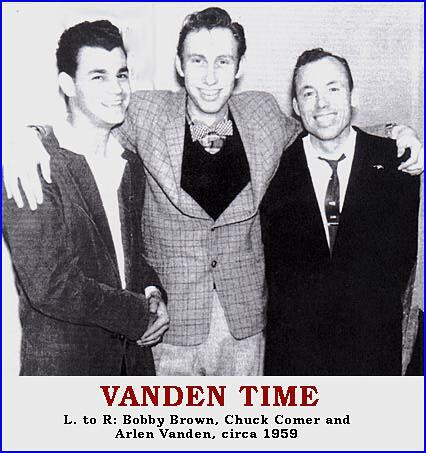 I had become acquainted with Arlen Vaden in 1958 after he came back from doing a DJ show in Cincinnati, Ohio. He had started his Vaden Record label and Bobby Brown was his first artist. Teddy Rydell also recorded for him and my band backed him up. Teddy was actually the piano player in my band at that time. We had a pretty good little band. I had been writing songs for a number of years and Arlen became interested in a song of mine called "Shall We Dance". So we went into a small radio station in Arkansas and recorded that song. The song I became best known for was on the other side. It was an afterthought - "Little More Lovin' ". We all joined in and had a ball recording it. Arlen and his brother and Tommy Wagner were the voices behind me (doing the callbacks). So it turned out pretty good. I had no idea that it would later become a minor rockabilly classic in Europe. In this part of the country the "Shall We Dance" side got a lot of play on the jukeboxes. We worked with other artists such as Carl Perkins etc. Warren Smith and Sonny Burgess were kind of partners in my band for a while as different members came and left. Primarily, I did the bookings. I didn't do all that much singing. We had a few vocalists other than myself. Tommy Wagner being one of them. Actually, I was a country singer. 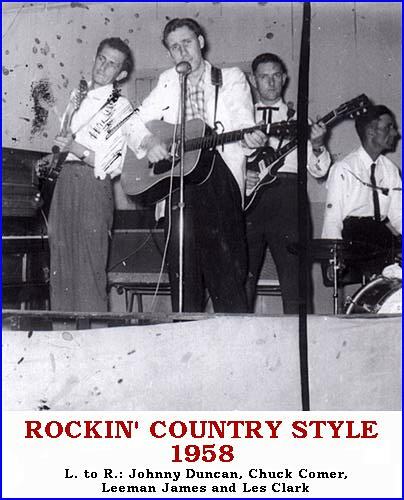 I was raised on country and became interested in country music in the late 1940's. That was the period that I really got into music. In the mid 1950's if you didn't do something akin to what Elvis Presley and some of the others were doing at that time you just didn't work the clubs because that's what the people really wanted to hear. So I wrote a few rockabilly songs. Rockabilly was something that just happened and caught the publics attention for a while. Charlie Feathers and I were good friends. He was one of the true early rockabilly artists that I knew. About 1959 I had been booking some acts out of Nashville and Jimmy C. Newman suggested that I be selected for a program on WSM that was called MR. DJ USA and every Friday night a different DJ from around the country was treated to a weekend in Nashville and appeared on the Grand Ole Opry. I appeared as a guest on along with Conway Twitty. Neither of us sang but Conway was introduced as a leading rock and roll singer. After the Vaden single I did a Gospel record of four songs I had written. It was recorded to sell mainly on the radio as I had a gospel show. I sold thousands of them almost as soon as I got the records back from the pressing plant. They went real fast so I did good with that venture. During my time as a disc jockey in Newport there was a state wide contest and I was voted the 2nd most popular DJ in the state of Arkansas. I got a little publicity out of that and rather enjoyed it. About 1963 after my divorce from my wife at the time, I had asked the radio station owner, of KNBY, if he had an opening at another one of his stations if I could make a change. In 1962 he opened a radio station in West Memphis, Arkansas KSUD. At first it was a rock n' roll but in the early 1960's the format changed. I went to work there Jan. 12, 1963 and the format was folk, country and gospel. I spent several years there. It was around this time I got in touch with Gene Williams. He had a record label called Cottontown Jubilee and he was recording a lot of the local artists. He also made me sales manager of his record label for a time. I also had a release on the Millonaire and CMC Record labels. My recording career was short lived and less than spectacular. It was a side line throughout the years but I did really enjoy it. My health is not what it should be but the years do that to us you know. I was inducted into the Memphis Music Hall of Fame in 1996. They have a display on me over there.